When I worked at NeXT and later Apple, we always made sure WorkspaceManager.app reflected the current version of the Operating System: in this case Openstep 4.2. I find it a bit odd they would have Finder not in synch with the versioning of OS X. Of course all system apps have retained their unique revision numbering as expected, but that 10.4.1 strikes me as odd. I would at least expect 10.4.2 to have a 10.4.2 Finder. What caught my eye is that Finder doesn't actually have a unique build number. 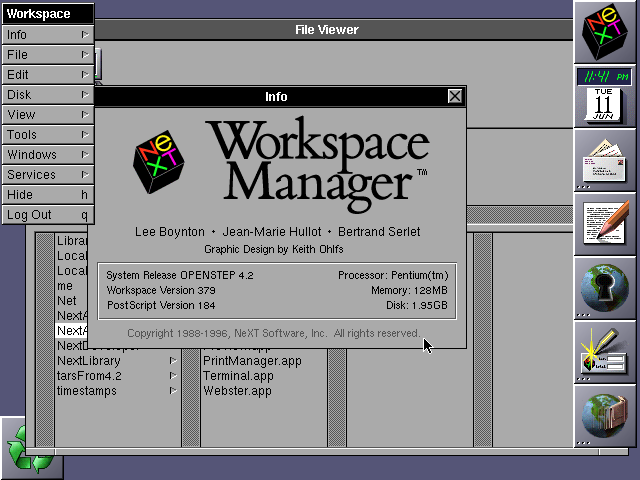 Here is WorkspaceManager.app for Openstep 4.2. Just a nitpick of course, but I'd prefer they don't synch Finder build revisions to that of OS X revision numbers, if they can't keep them synched. Does the changelog list anything as being changed in regard to the Finder? If not, why is there any reason to change the version number? Yes the changelog lists changes for 10.4.2 in Finder. Every dev build has modifications. The point being, release it as the Build Revision, not OS revision and then don't synch it up is pointless. I won't even mention the fact the font layout is off between the two.